Sherry Davis is a Music Heritage Preservationist specializing in the advocacy of W.A. Mozart. Her authorship of "The Chronicles of a Modern-Day Mozartian" has been instrumental in encouraging a broader appreciation and understanding of his life and music. From interviews with leading industry professionals to world premiere exclusives, she has continued to fill its pages with articles designed to inform, inspire and connect Mozart's audiences around the world. When I discovered Anne of Green Gables as a child, I was inseparable from the adventures of the orphan girl who seemed to possess an almost super-heroine-like quality. Mighty in erudition, courage and perseverance, yet with an endearing and imaginative vulnerability, I wanted to be just like her. So, when I was contacted by Sullivan Entertainment, the company that produced Anne of Green Gables, to preview their film The Magic Flute Diaries, I was eager to once again experience the storytelling of Kevin Sullivan. And this time, it would be a love story within the context of an opera production in Mozart's native Salzburg. How exciting! Within a few days of our exchange, I received the film and its official companion book in the mail. As I reviewed these materials, I had several questions for the visionary himself, Mr. Sullivan, which he generously answered in the provided video interview. 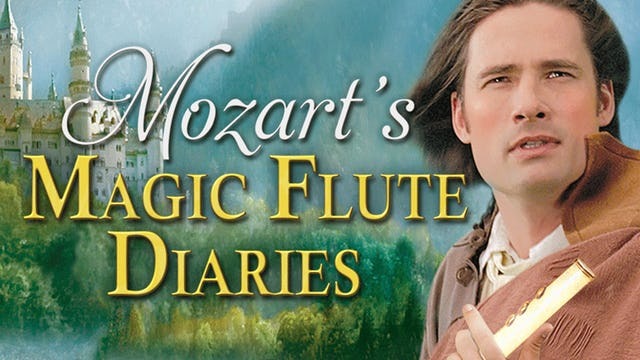 1) Having the opportunity to combine your love of Mozart’s music with your passion for writing, producing and directing, I can only imagine what a pleasure it was for you to create The Magic Flute Diaries! What ultimately compelled you to pursue it? 2) In the official movie companion, the introductory piece communicates your personal sentiments towards The Magic Flute as being Mozart’s greatest work for the stage. Why do you feel it deserves such regard? How did you come to know and admire Mozart? 3) Anne of Green Gables is one of my favorite movies! I’m wondering if you thought of any of these characters while you were writing The Magic Flute Diaries? Is there a bit of Gilbert Blythe in our young singer Tom? How did your experience with period dramas translate generally to the task of writing this story? 4) In the official movie companion and DVD special feature, not only is the opera’s nexus to the Masonic Order greatly emphasized, but there’s a great deal of effort given towards demystification of the Order as well. Why do you feel it’s important for the audience to know about this layer of the opera and about the Masonic brotherhood? What is your favorite Masonic piece written by Mozart? 5) The role of film in creating accessibility, excitement and relevance for Mozart’s music and biography cannot be emphasized enough in its significance. The Magic Flute Diaries is an example of the medium bringing audiences closer to this extraordinary life. How have audiences responded to The Magic Flute Diaries? Do you anticipate making another film about Mozart in the future? Are there other films about Mozart that have inspired you? Tamino (Warren Christie) in The Magic Flute Diaries. Image provided by Sullivan Entertainment. The insight provided by Mr. Sullivan in the interview offers an elaborate window into the soul of the film. So many of his comments stand out to me, but this one I believe defines the essence of his homage to Mozart: "I'm always looking for a way of enlightening people about themselves." Indeed. Mozart, in his ever-masterful accompaniment of human nature, constantly holds a mirror to our lives. Measure for measure, he challenges us and pleads us for introspection as we subconsciously plunge into vicarious relationships with his melodies and characters. While Tom, the singer, and his character in the opera, Tamino, both pursue quests for self-actualization in The Magic Flute Diaries, so does the viewer. The restlessness of the intertwining plot doesn't permit viewer passivity. It's not another linear interpretation of the opera. With these dual-quagmires, we are charged intensely with the most cardinal of Mozartian rules: the responsibility to look inward. Audiences enjoy Mozart's operas as a source of entertainment and spiritual and/or philosophical nourishment. The Magic Flute Diaries honors this duality with a spectrum's shadings of comedy and reverence, technology (CGI to heighten the fantastical) and humanity. From the opening scene featuring a starry-eyed singer smitten with Mozart and his native city to the resonant conclusion, Mr. Sullivan's understanding and admiration for the composer are evident throughout the story. Mozart was his muse in every sense. I'm sincerely grateful to Mr. Sullivan and the Sullivan Entertainment team for giving me the opportunity to conduct this exclusive interview and share this film with a broader readership. It's an honor to connect with a fellow Mozartian who keenly understands and embraces the fact that his gifts in film production directly contribute to the sustainability of Mozart's audience.